As I think I may have rambled on about previously: if you are going to go see a tribute act, ensure you catch the best. 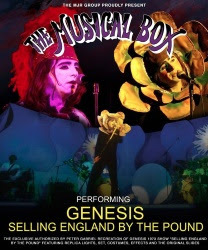 And I think there are probably few folks who would argue that when it comes to impersonating Peter Gabriel-era Genesis, The Musical Box have few peers. 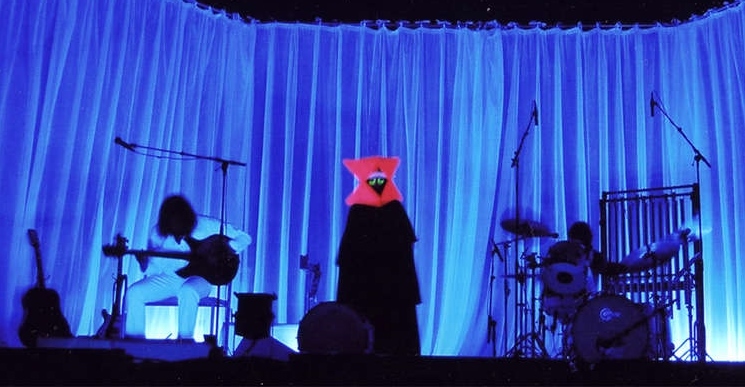 These chaps – French-Canadians – have, we learned, impressed the “real” Genesis so much, they have been given access to both the original backdrop slides and lighting from the Seventies shows. At least three of the proper 'uns; Messrs Gabriel, Collins and Hackett have pitched up to attend an MB concert, the last two named actually joining the imposters on stage during encores. The fact the MB have been on the go for over twenty years attests to the fact they must be getting something right. That being said, a downside of such longevity is that what we saw this evening were clearly five middle-aged men impersonating Genesis lads who were in their mid-twenties. The chap playing Michael Rutherford, in particular, looked extremely well-nourished shall we say, and I would attest all but Steve Hackett/François Gagnon were wearing wigs. But of course the prime role of the other four guys was to provide the musical backdrop to a recreation by singer Denis Gagne of Peter Gabriel's theatrical shenanigans. And one has to acknowledge a rather fine job Gagne does - although I regret to admit I can only compare him to grainy YouTube footage of the original – me having been born just a few years too late to have caught Gabriel-era Genesis. He does have Gabriel's voice down to a tee. Perhaps the Little Weed flower-head is just a little too familiar these days, but the Watcher of the Skies bat-wings/dayglo eye-liner/chalk white face image still packs a punch. And the creepy old man at the end of The Musical Box, and that odd red box Magog thingy really are quite mesmerising. One costume I was unfamiliar with was that donned during The Battle of Epping Forest, which was little more than a black stocking over the head with a hole ripped for the singer's mouth. Unfortunately, the white face make-up also showed through around the lips and the image, particularly so when a straw hat was donned, appeared embarrassingly close to one of those blacked-up minstrels from the infamous Black and White Minstrel Show. Given the song is shite, the MB really should just drop it. But then perhaps to suggest so misses the point: this show recreates as far as possible, a 1973 Genesis gig – warts and all. Gabriel's between song – I was going to use the word introductions, but ramblings is probably more apposite - really have not worn well with time. There would have been a quirky Python-esque quality to them back in the day, but this evening most of the audience appeared to cringe their way through them. 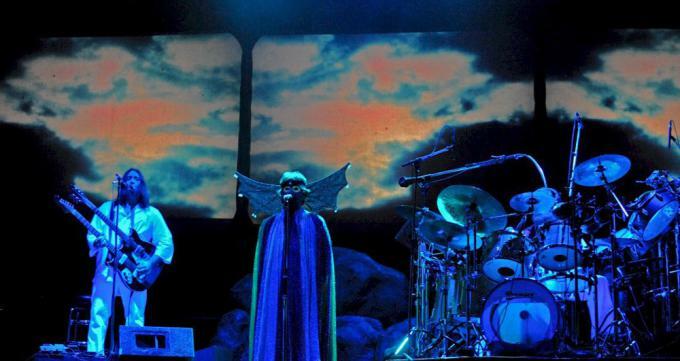 Musically however the band were superb, seemingly effortlessly recreating those prog epics of yore. Indeed, heightening the verisimilitude by performing the renditions of a number as they appeared on the Genesis Live album - complete with Michael Rutherford farting bass guitar sound. Although Guillaume Riva messing up Tony Banks' piano intro to Firth of Fifth, and having to restart it, I could not work out whether it was part of the show or not. Apparently the MB also do a more than passable Lamb Lies Down on Broadway. That I think, I would rather like to see. Not my pix - but shamefully stolen from other websites. If they are yours, let me know and I shall either take down or acknowledge.